Discussion in 'Canon InkJet Printers' started by Bob Thompson, Jul 14, 2016. Sooo I recently very foolishly purchased this printer 2nd hand. When I print or scan, there are several white lines through the document. I have attached pics to show this and also the inside of the printer. I have tried every clean and check available on the printer, although when I attempt a deep clean, I receive an error message and have to unplug at the wall (pic also attached). However, I was able to run deep clean via commands on the laptop when it was attached, but the problem remains. The black ink cartridge is new, I installed it as soon as I got home, and the color cartridge is empty and belonged to the previous owner. Has anyone got any suggestions? Or should I try dragging it to a print store where I live? I'm new in Taiwan, so hoping to avoid the latter if possible. I think the white line in the black print is caused by a clogged nozzle. Was the black cartridge a new and unused genuine Canon cartridge, not a refilled/remanufactured cartridge? If it is a genuine Canon OEM cartridge, you might get it replaced as it is most likely defective. Even if it is expensive I suggest to try two new original Canon cartridges. In many parts of the world the XL versions of the cartridges are 50% more expensive but lasts for the double number of printed pages compared to the standard cartridges. Thanks for this. Yes, but I bought the black cartridge new but not from a particularly official place. It was sealed, however. Do you think it could possibly be anything else causing it? I am worried about spending even more in case it doesn't resolve it but I guess perhaps it is my best option. That makes sense about the error, however, I guess a deep cleaning would not assist in this situation anyhow? Some Canon two cartridge printers have a setting that will allow them printing with only one cartridge. You can chose between printing with either the black or the coloured cartridge or both. Maybe selecting black only will allow you to do a deep cleaning of the black cartridge without error messages? I tried selecting black cartridge only for a Canon MP270 and removed the colour cartridge for printing with the black cartridge only. This caused an error message, both cartridges must be installed. But you could give this a try with the colour cartridge left in place. A deep cleaning might bring the missing black nozzle(s) back, but will not clear the Error 5200. only a new colour cartridge might eliminate this error. Thanks again! Unfortunately deep cleaning (which was surprisingly brief), doesn't seem to have fixed the problem. You think a replacement cartridge could still help? Or does this mean the printer is dead? 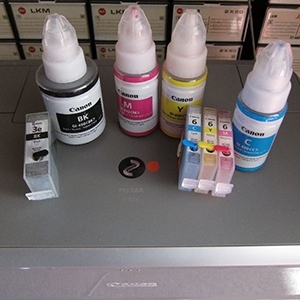 I admit that I am guessing, but I think that a set of new genuine cartridges from an official seller of Canon cartridges will bring the printer back to good working order. Some refilled/remanufactured cartridges also come in sealed packages.